I'm noticing eyes are all the rage lately. Kind of creepy but kind of intriguing? I'm digging the attention they give- full on alert stares. It would be kind of nice to doze off while our clothing keeps focused on the task at hand....if only. I'm mesmerized by the red skirt. I think it would be a fun fall piece combined with a blazer. Kenzo's F/W collection is all about these eyes, kind of quirky and fun. And how about that sweet cyclops iPhone case? It's from Kate Spade's collaboration with NYC artist Craig Readman- so cute!! Any collaboration that creates a donut bangle is pretty cool in my book. Also loving Lulu Guinesses clutch and tote. And that eye sweatshirt would be perfect paired with a black plaid skirt or even jeans. All these eyes remind me of the myth about Argos, Hera's faithful servant, who had one hundred eyes all over his body. He had to watch a white cow and keep it away from Zeus. 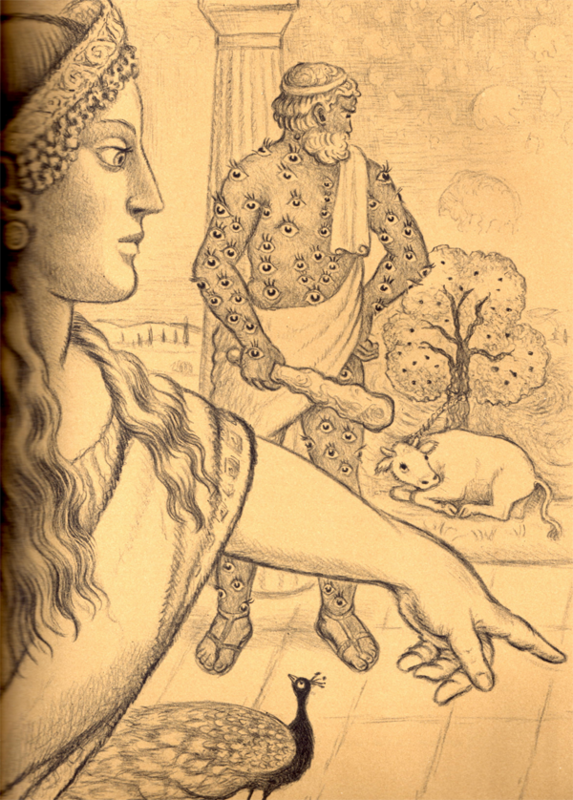 But Zeus was able to put him to sleep and killed him to free the cow. So to commemorate his faithful servant, Hera preserved Argos' eyes forever in the peacock's tail. Just another example, of how inspiration is everywhere and ideas are recycled. I would feel a little like Argos wearing that red skirt. Here is an image of Argo so you can envision what 100 eyes looks like (no wonder he was such a good guard....he had eyes everywhere!). and here are his eyes immortalized on a peacock's tail. I'm not too dorky right? So, back to the eye trend.....yes? or no? oh, loving that iPhone case! This reminds me of The Great Gatsby! I love that skirt! Have you seen Allegra Hicks' book? Want!! I love, love the Lulu Frost collection that's all about eyes. i think i like the eyes more on the accessories rather than on clothing. but definitely an intriguing trend! That skirt is just awesome. How fun is that clutch?! Definitely a convo starter! love this clutch. i am obsessed with evil eye everything so of course i was very excited about this post! 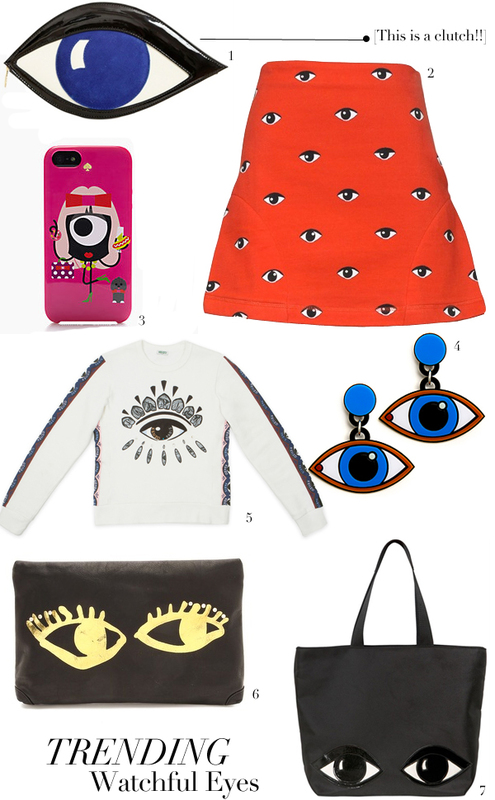 I prefer the eyes on the accessories and I especially like the tote. 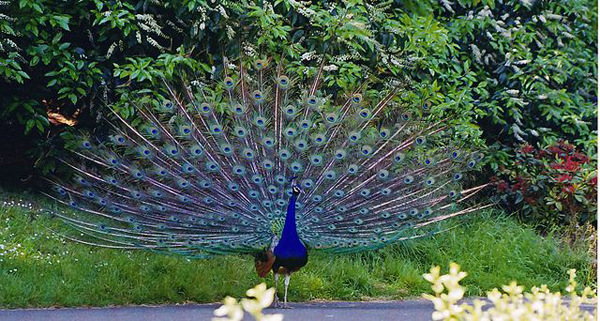 I'm always amazed by the beauty and colours of peacocks! I had never heard the myth of Argos - it is fascinating. I am not sure I could deal with all the eyes but maybe something small like a piece of jewelry. How fun! Not something I would probably wear, but SO cute and a very different trend!! Very Egyptian! I've noticed this trend as well. Not sure I am going to warm up to it, but I do love the eye pouch you picked out- too cute! Love the myth about the peacock, not sure about this eye-catching trend! Love the myth about the peacock, not sure about the eye-catching trend... Maybe a bit Monsters Inc. for me! Ummm I'm not loving it, though I do love peacocks! I have a lot of evil eye jewelry- but nothing as awesome as that clutch!